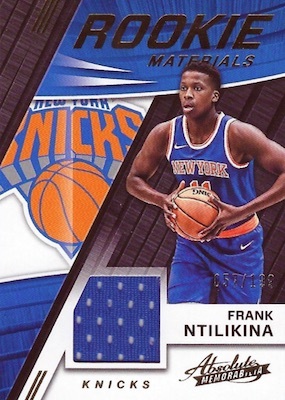 Showcasing a fresh design, 2017-18 Panini Absolute Basketball brings familiar choices for collectors, and a few new things. Each hobby box delivers four hits, including a pair of autographs and relics, plus two uncirculated cards. 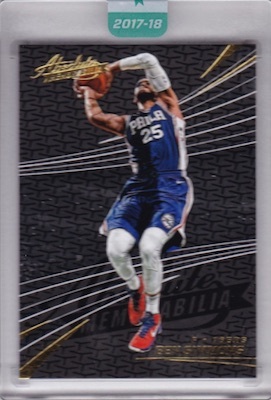 Despite offering fewer cards per box than the '16-17 product, 2017-18 Panini Absolute Memorabilia NBA features debut inserts to discover and a more clear expectation for the box hits. 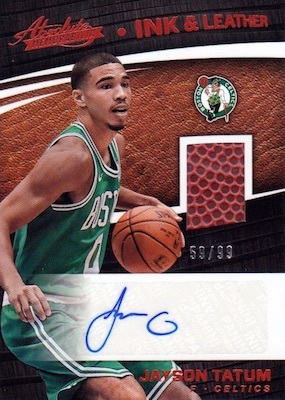 Signed at the 2017 NBA Rookie Photo Shoot, the main Rookie Autograph set features on-card signatures. 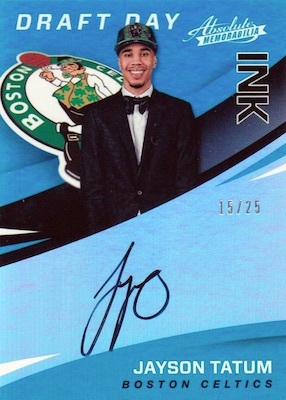 The Draft Day Ink insert is another hard-signed option that features first-year players. 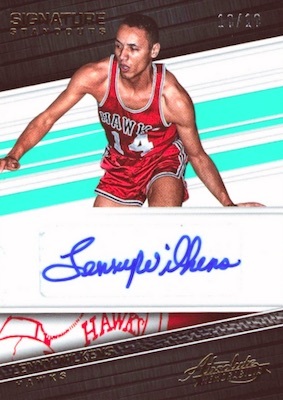 Additionally, other 2017-18 Panini Absolute Basketball autograph selections include Determination, Precision Signatures, and Signature Standouts. 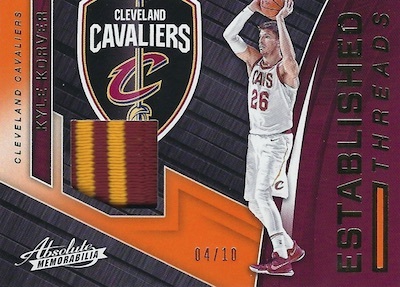 Since its earliest days, the Absolute brand has been known for memorabilia inserts, and the 2017-18 release continues that tradition by offering a plethora of relic pieces. Focusing on veterans and retired stars, Pass the Rock Memorabilia features a piece of basketball leather. More varied, the signed Tools of the Trade insert includes memorabilia swatches from jerseys, hats, and basketballs. 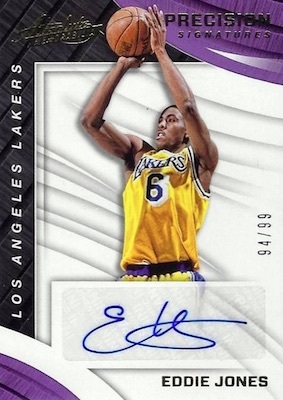 There are several versions of the single-player cards to chase, including Three Swatch Signatures, Four Swatch Signatures, and Six Swatch Signatures. 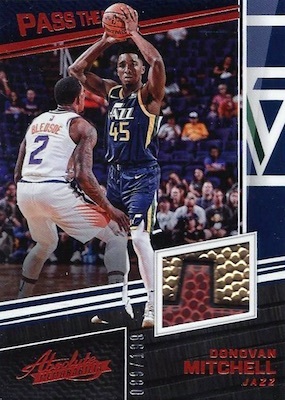 Outside of the autographs and memorabilia, every 2017-18 Panini Absolute Basketball box includes two Uncirculated cards, which are encased, with one featuring a 2017 draft pick. Lastly, the Absolute Glass insert falls one per case, making this a limited chase. See the available listings for 2017-18 Absolute Memorabilia on eBay. 100 cards. 2 per box. 35 cards. Serial numbered #/99. PARALLEL CARDS: Level 2 #/25 (Bryant - #/15*), Level 3 #/10, Level 4 #/5, Level 5 1/1. 15 cards. Serial numbered #/25. 25 cards. 1 redemption per case. 35 cards. Serial numbered #/199. 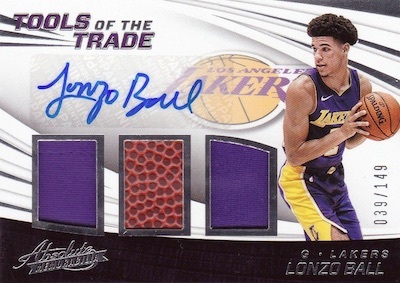 PARALLEL CARDS: Prime #/25 (Kyle Kuzma, Josh Hart - #/10*). CARD VERSIONS: Level 2 #/25 or #/15, Level 3 #/10, Level 4 #/5, Level 5 1/1. All subjects not included in parallels. View specific options with the spreadsheet. PARALLEL CARDS: Level 2 #/25, Level 3 #/10, Level 4 #/5, Level 5 1/1. Will this product be in a retail version this year, Lisa? There has been no word about a retail format at this point. Do not be fooled by the flashy cards with big-name rookies – those are few and far between. Most boxes will result in a loss, this product is not worth the price ($20/card). Disappointing that the glass inserts are redemptions, which Panini is notoriously slow to fulfill. May only be worth it if the price is lowered or if you get a good team in a case break. Why are all the reviews bad? This product ROCKS! I bought 2 hobby boxes from my local shop “Who’s On First” because that’s all he had. When we finally got home, traffic sucked we pulled “LUCKY ME” a case hit glass insert of Chris Paul. Its a redemption card but hey who cares, sometimes you have to be patient and wait for things. Ya buddy I was excited. I know hes not the best but hey I pulled a case hit for $120.00 from my local hobby guy here in Washington. 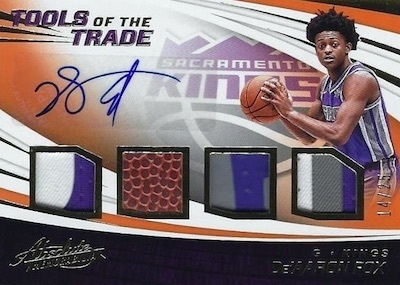 In the second box and additional $120.00 was a De’Aaron Fox Tools of the Trade quad relic auto 09/99 and a Malik Monk Rookie Materials 11/25. Man it felt like Christmas all over again. I agree Panini is not always up on the quality of there cards but they did it right with this release. 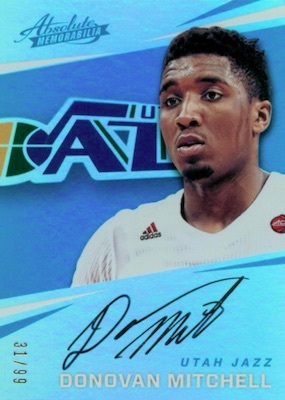 Forgot to mention we also pull a Donovan Mitchell slab rookie card. :) Thank you Cardboard Connection, Panini and Who’s on First! Keep it up! more Panini garbage… they went from 20 cards per box to six… bought into a group break and was disappointed with the number of no-name rookies (some of them have already washed up). also, one of the “hits” is a tiny, single color relic card with no autograph. The highlight of my box was 600 panini points. The encased “uncirculated” cards were supposed to be a big hit but the market is flooded with these mag cash base cards that have no serial numbers and little value. Absolute memorabilia was always a good mid level to premium product with 3-4 hits in 4 inner boxes. Now it’s barely mid level with 2 inner boxes and 2 hits. Lose the “uncirculated” cards Panini please. I bought a box from my local card dealer ( JUNIATA CARDS ) and I got soooo lucky, I got a case hit glass redemption LONZO BALL ! The other cards in the box weren’t so great. Robert parish – Established threads , D.J. 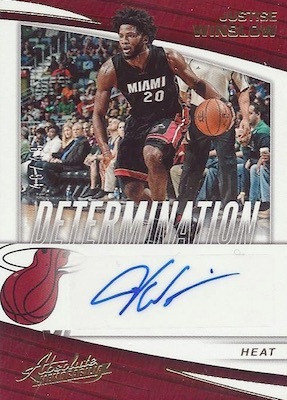 WILSON – Tools of the trade , a JAWUN EVANS Auto. , KYLE KUZMA base RC and a JOHN COLLINS ROOKIE materials and 2 other useless ones. Since then , I’ve bought some glass etched ones on EBay. How many glass etched did they make of each player is my question. I’m trying to find the answer online but I can’t find it. HELP ! ! 2017-18 Panini Absolute Basketball Hobby Box Factory Sealed 2 Packs - 4 Hits!